Can re-freezing embryos lead to successful pregnancy outcomes? The practice of freezing embryos for future treatment is well established and has good outcomes, but would a successful pregnancy be possible if the embryo was re-frozen and thawed? This is the question asked by Charikleia Papanikou, embryologist at Bourn Hall Clinic Colchester, and her findings were printed in the spring issue of The Embryologist. Human embryos are robust and able to withstand the stress of the freezing and thawing process at different stages in their development from 2PN (two pro-nuclei) cleavage stage up to blastocyst stage. This has allowed embryologists to consider re-freezing under some circumstances, for example if the patient is at risk of Ovarian Hyper Stimulation Syndrome it may be agreed to freeze all the embryos to allow her time to recover before embryo transfer. If the first frozen transfer was unsuccessful, a re-frozen embryo that had not been previously required might be used for a further cycle without the need to repeat ovarian stimulation. Other situations may include unforeseen personal circumstances where the embryos were thawed but transfer could not proceed or where there was unexpected vaginal bleeding associated with the thinning of the endometrium. 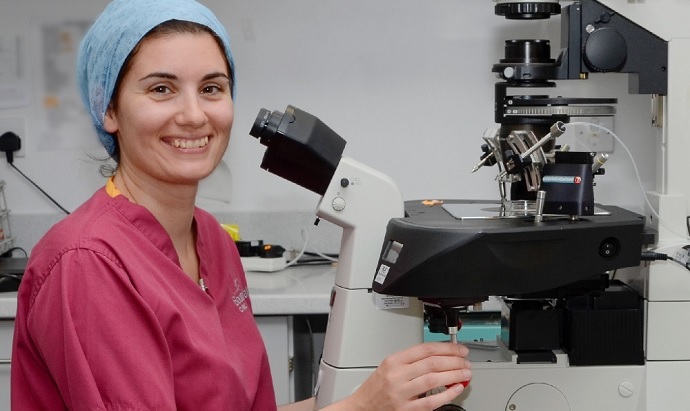 Research by the Association of Clinical Embryologists (ACE) found that 77 per cent of embryologists would consider re-vitrifying embryos where applicable, so she investigated further to see if there was scientific evidence to support this practice. Her literature research showed that in a number of studies there was no difference in pregnancy rates between once and twice thawed embryos, despite a lower post-thaw survival rate in some cases. A further study revealed that healthy live births can be achieved regardless of the initial stage of freezing. Charikleia says that these findings led her to consider further the effects of two rounds of cryopreservation on the embryos. Furthermore, successful live births have been reported after trophectoderm biopsy, where cells are removed from the outer layer of the embryo for genetic screening, and then the embryo is re-frozen prior to transfer. This suggests that refreezing could be used within Pre-Implantation Genetic Screening (PGS), offering greater flexibility and better management of the programme. The full article can be read in The Embryologist, Spring 2017 pages 5-6.